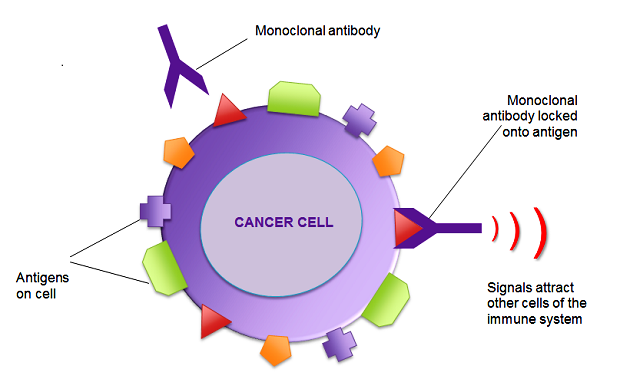 Monoclonal Antibody Therapy is a form of Immunotherapy that uses monoclonal antibodies (mAb) to bind mono-specifically to certain cells or proteins. This may then stimulate the patient’s immune system to attack those cells. Monoclonal Antibodies are laboratory-produced versions of immune system proteins that have been engineered to serve as substitute antibodies that can restore, enhance or mimic the immune system’s attack on cancer cells. The immune system is composed of a complex team of players that detect and destroy disease-causing agents, such as bacteria and viruses. Similarly, this system may eliminate damaged or abnormal cells, such as cancer cells. One factor in the immune system is the work of antibodies. An antibody attaches itself to a specific molecule (antigen) on the surface of a problematic cell. When an antibody binds to the antigen, it serves as a flag to attract disease-fighting molecules or as a trigger that promotes cell destruction by other immune system processes. Cancer cells may outpace the immune system, avoid detection, or block immune system activity. Flagging Cancer Cells: Some immune system cells depend on antibodies to locate the target of an attack. Cancer cells that are coated in monoclonal antibodies may be more easily detected and targeted for destruction. Triggering Cell-Membrane Destruction: Some monoclonal antibodies can trigger an immune system response that can destroy the outer wall (membrane) of a cancer cell. Blocking Cell Growth: Some monoclonal antibodies block the connection between a cancer cell and proteins that promote cell growth — an activity that is necessary for tumour growth and survival. Preventing Blood Vessel Growth: In order for a cancerous tumour to grow and survive, it needs a blood supply. Some monoclonal antibody drugs block protein-cell interactions necessary for the development of new blood vessels. Blocking Immune System Inhibitors: Certain proteins that bind to immune system cells are regulators that prevent over-activity of the system. Monoclonal antibodies that bind to these immune system cells give the cancer-fighting cells an opportunity to work with less inhibition. Directly Attacking Cancer Cells: Certain monoclonal antibodies may attack the cell more directly, even though they were designed for another purpose. When some of these antibodies attach to a cell, a series of events inside the cell may cause it to self-destruct. Delivering Radiation Treatment: Because of a monoclonal antibody’s ability to connect with a cancer cell, the antibody can be engineered as a delivery vehicle for other treatments. When a monoclonal antibody is attached to a small radioactive particle, it transports the radiation treatment directly to cancer cells and may minimize the effect of radiation on healthy cells. This variation of standard radiation therapy for cancer is called radio immunotherapy. Delivering Chemotherapy: Similarly, some monoclonal antibodies are attached to a chemotherapeutic drug in order to deliver the treatment directly to the cancer cells while avoiding healthy cells. Binding Cancer and Immune Cells: Some drugs combine two monoclonal antibodies, one that attaches to a cancer cell and one that attaches to a specific immune system cell. This connection may promote immune system attacks on the cancer cells.